The Magid A.R.C. IND2530HV Arc-Resistant Jacket is flame resistant and made of a 12 oz. 100% cotton Indura whipcord material to protect workers from Arc flash hazards. The IND2530HV Arc-Resistant jacket meets the NFPA 70E HRC2 standards, and has a calorie rating of ATPV 12.9 cal/ cm². 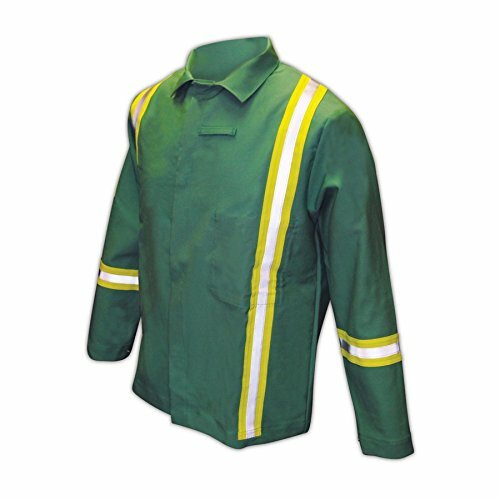 The most unique feature of the IND2530HV jacket is its FR hi-viz trim pattern featuring 3M Scotchlite reflective material on yellow modacrylic (2" yellow/ silver/yellow) for increased user safey, visibility and FR protection. Additional comfort features include a concealed snap closure front and snap closure at wrist.